Day 5 in EBC: the base camp puja | Edita's Blog - "Intotheblu"
This is my 5th day in Everest Base Camp (EBC), and it’s exactly two weeks since we left Kathmandu at the start of the expedition. 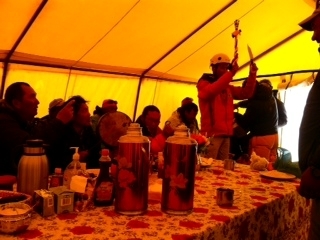 Yesterday we had our puja, a Buddhist religious ceremony that each expedition has before they start climbing. 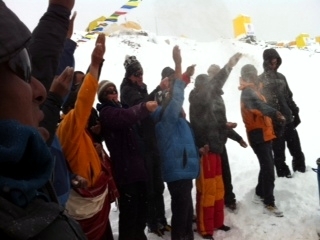 For the Sherpas the puja is very important, and they will not start climbing before it. It is a way for them to ask the mountain gods permission and safe passage to climb. For this occasion we had a real lama come up to base camp from one of the monasteries in the Khumbu region. Our puja began around 8am yesterday. It was snowing the night before, and it was still snowing in the morning, so we had the ceremony in our dining tent. The lama was very good – he kept chanting and interacting with everyone. A big part of the ceremony is drinking chang – Nepalese rice wine. A Sherpa went around refilling our cups without stopping. Then another Sherpa went around with a bottle of rum, giving full three caps each time. For the lama and Sherpas it is very important that we all participate in this ceremony, and that we drink. The more we drink, the more they are happy! The puja continued for a few hours, followed by Sherpa dances. We all danced as well. It is very rare, but our lama also joined in with the dancing. He was smiling a lot at the end, and all the Junkies did great! After the official ceremony there were many tears and hugs as we remembered those who died on the mountain. Many Sherpas and several of us climbers knew Samuli Mansikka, a top Finnish mountaineer who died on Annapurna last month. 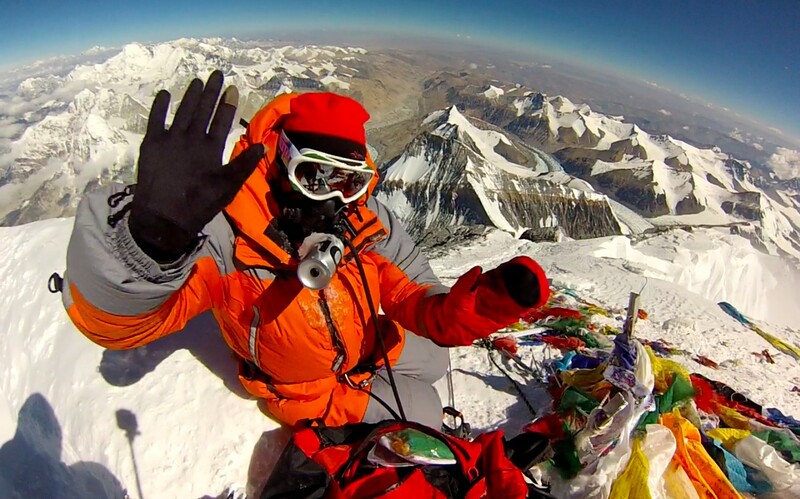 I remembered my Sherpa friend Dorje Khatri, whom I climbed Cho Oyu with in 2011, and who lost his life in front of our eyes last year as we watched the tragic avalanche in the Khumbu Icefall which killed 16 Sherpas. There were many emotions going around and we stayed together till after dinner. I believe this day bonded us as a team for the season. Today is a rest day and we are in no hurry to start climbing the mountain. Our bodies will take at least three weeks to acclimatise. The best way is to relax and rest. Some exercise is also important. Some groups here at EBC are going to acclimatise on Lobuche East. Our group leader Phil doesn’t think it’s necessary, as many of these people will have to go through the Icefall at least twice anyway. Last year a climber broke his leg on one of these acclimatisation climbs. It is safer to stay at base camp and take daily walks. Margaret and I walk at least 2 hours each day. We walk to Pumori base camp close by, and for a change of environment Gorak Shep is less then an hour’s walk away, where there are several tea houses. There is usually a 3G connection in Gorak Shep and we can spend a couple of hours drinking tea and checking our emails. 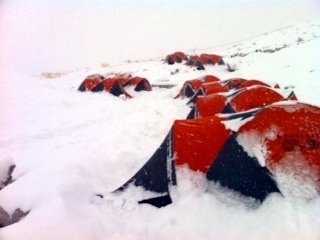 There has been some snow in the Khumbu region that has delayed our expedition plans. 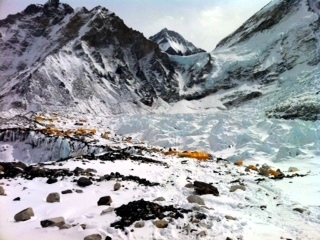 Our Sherpas planned to go to Camp 2 to check the gear they left from last year. We still have plenty of time and are in no hurry to climb. It is important to be patient and listen to Chomolungma – she is the one who needs to be respected. We will climb when she is ready, not when we want to climb. There are many inexperienced climbers each year who get into trouble and create a bad reputation for the rest of the climbing community. I hope they will also respect the mountain.